I don’t often go to Port Louis – well not unless I really need to! That is how most people in Mauritius feel about the capital I think. It’s big, hot and sticky, noisy with too many cars. But once in while well I have to bite the bullet. This time was for my car servicing. Unfortunately, I wasn’t very lucky with the weather: it kept raining on and off the whole day – so all the things I had planned well I couldn’t really do them. Well never mind: I spend the day with my in-laws. As you might know they are of Chinese descent: 3rd and 4th generation immigrants from China. I really fancied eating a Briani – the Mauritian version of Biriani. 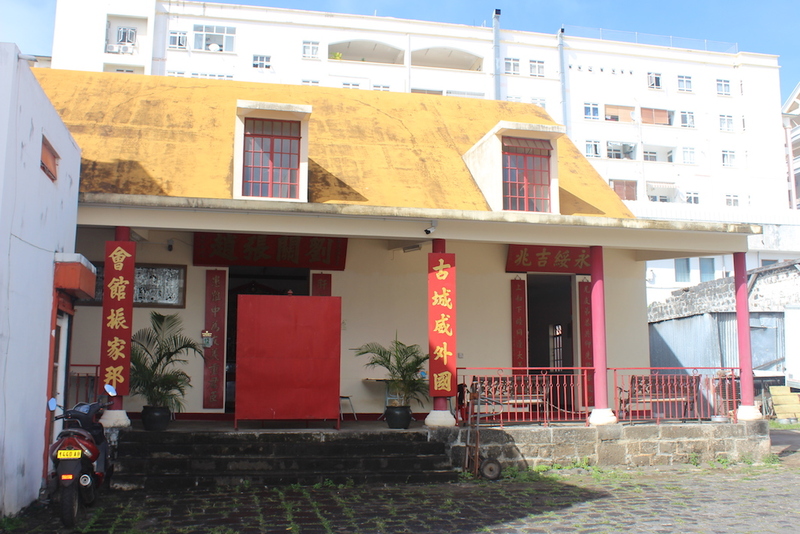 The best place – and one of the oldest ones in Port Louis is Ravenale. Well this is actually New Ravanale because they used to be located in a tiny place down an even smaller alley. They simply had to move because of a lack of space. The new restaurant complete lacks of charm, but the food briani is still as good. I’ll post about that place another time, when I find the pictures from the old place – because really when you talk culture differences, this one is great. So, as we were walking to the restaurant, I noticed a little gate open on the main street of Chinatown. That gate is always closed – even my mum-in-law commented that it was the first time she saw it open. So I had to peak – well yeah… am a bit nosy. At the end of the alley, there was a small pagoda: a Chinese temple. My father-in-law told me that it belongs to 3 different clans. All clans apparently have a small pagoda like this. I need to get my father-in-law to take me to theirs – a little mission for another day. 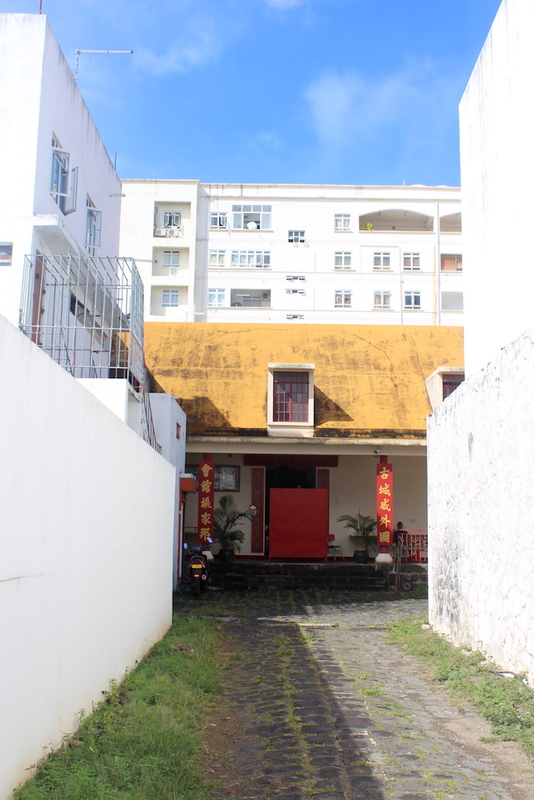 There are 11 pagodas in Mauritius and they are all located in Port Louis. Most (all?) of the pagodas in Mauritius are built facing North and the divinities facing the ocean. After lunch my parents-in-law decided to drive me to a pagoda. I have visited a few in Singapore, but never in Mauritius. Related article: Things to do in Singapore (including a very complete guide on Chinatown in Singapore). The first we went to was unfortunately closed. 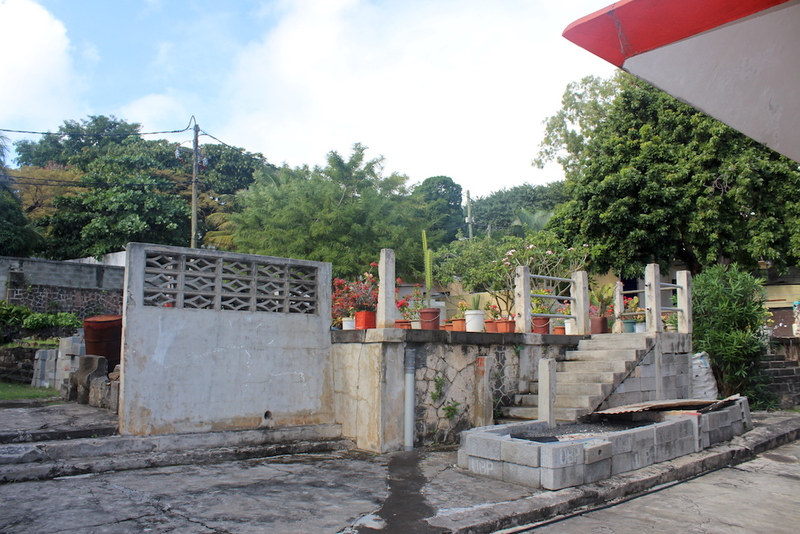 It is the biggest one of Port Louis, nicknamed ‘Les Salines’, because the temple can be found in the area where the first saltworks of the island were located. As far as I know they have all, unfortunately, disappeared and the only remaining today are to be found in Tamarin. The Kwan Tee Pagoda, also known as Guan Di Pagoda is the oldest in Mauritius; and apparently also in the Southern Hemisphere. It faces the sea on one side and have the the mountains behind it (North). The ground on which the pagoda lays was chosen according to Feng Shui, as the soil is considered prosper (still moving, so still providing). It celebrated its 175 anniversary in 2017. The cult of Kwan Tee is associated with the God of wealth. 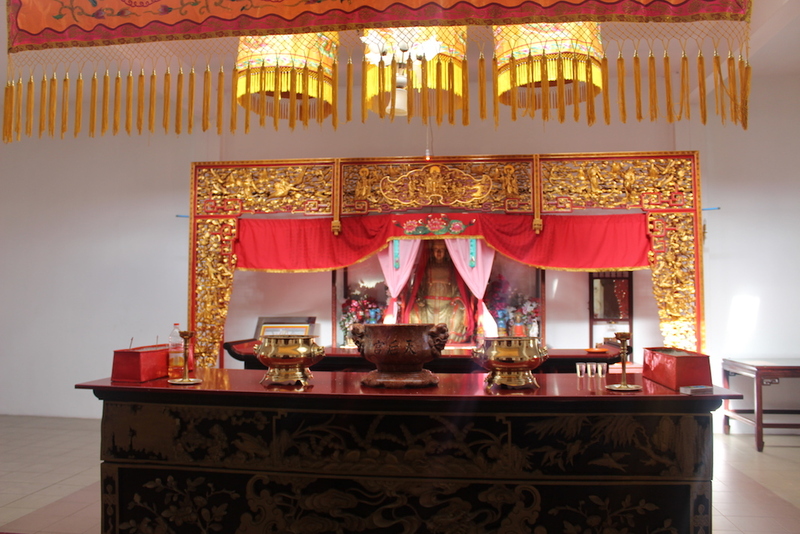 Kwan Tee is also the God of war and of righteousness, as well as the benefactor. The road behind the back entrance didn’t exist before as the ocean used to come all the way up to the gardens of the pagoda. Still toady, it is a lovely and quiet place, I think quite propitious to meditation. Kiddos 1 has visited with school (while they were studying heritage), but kiddos 2 still needs to go – am sure he will love it – he can be a very spiritual little one. This is one of the pagoda my father-in-laws family used to come to when he was a child. As this one was closed, we decided to try another one. 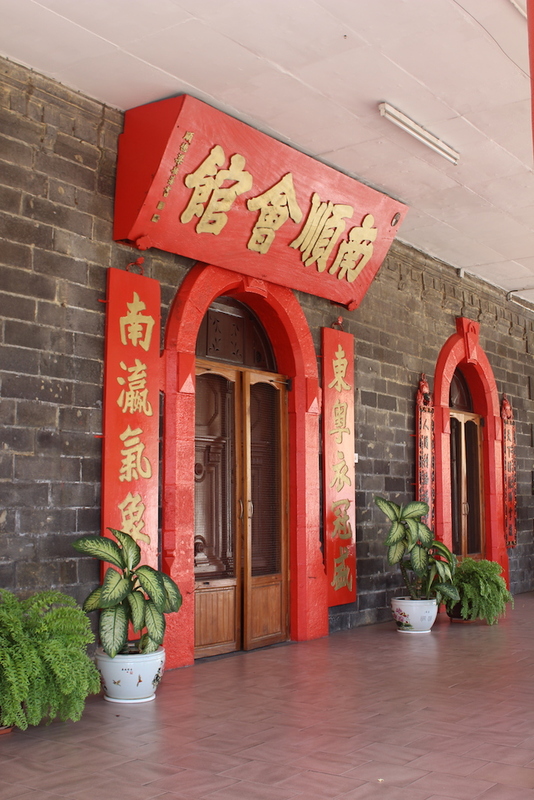 The Nam Shun Fooy Koon Pagodas are located next to the Champs de Mars, in the northern part of Port Louis. This is where my in-laws ancestors are buried. There are actually two Pagodas here: the Kwan Tee Pagoda and the Tin Hao Pagoda. The Kwan Tee Pagoda was first built in 1895, and renovation were started in 1970 and a new temple was inaugurated in 1980. 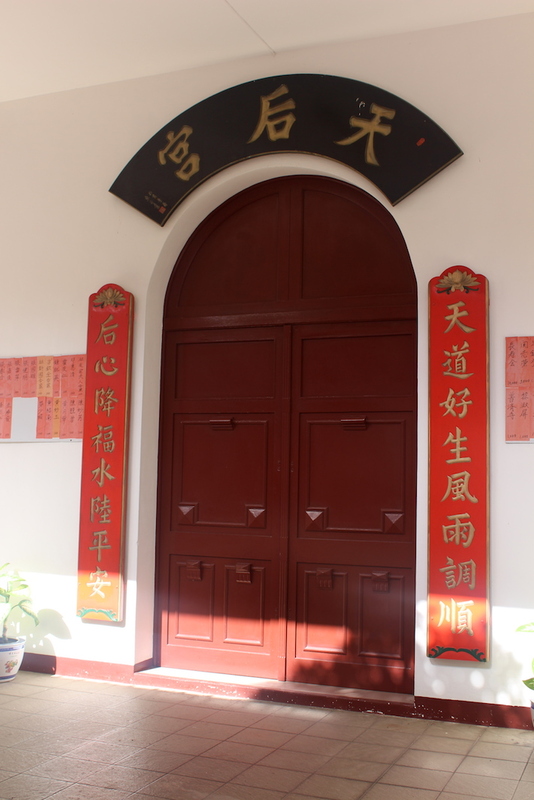 They kept the original walls, all the original statues and decorations were restored and can still be found in the temple. Kwan Tee was a great warrior and at the same time, a man of honour known for his righteousness and benevolence. At his death, he became a hero and is deeply revered by the Chinese people. 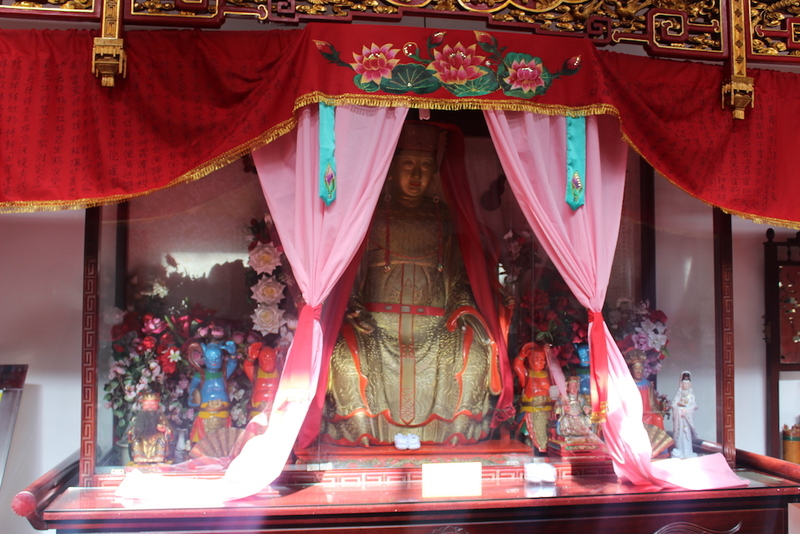 Besides Kwan Tee, the first Pagoda also houses an altar in the honour of Choy Sun, the God of Good Fortune. There is also a shrine for the deceased, that is where my children’s ancestors are. There used to be a cemetery at the back of the pagoda, but the building burned some years back and the altar was moved to the main pagoda. On the left of the Kwan Tee pagoda there is a little shrine where my father in law told me they used to make their first prayer when they arrived at the temple. 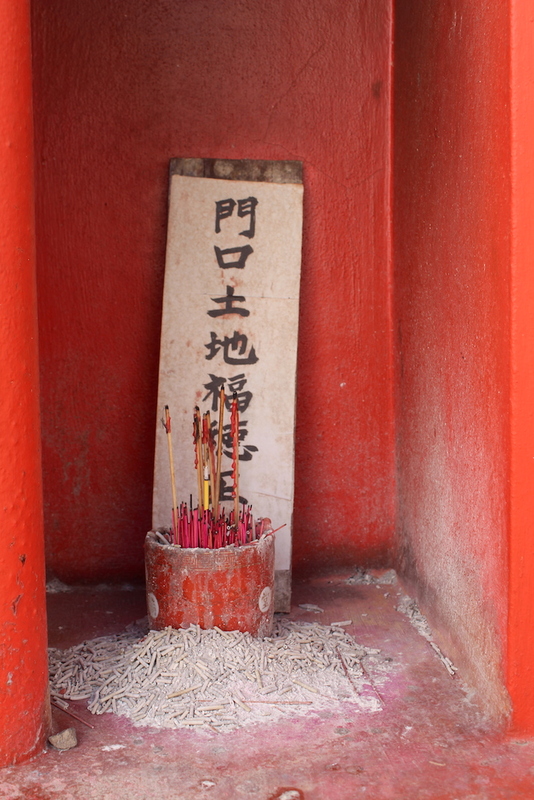 This was to pay respect, announce themselves and ask for permission to enter the pagoda. The other Pagoda, located a bit behind the first one, houses a shrine to Tin Hao, the Goddess of the sea. She is one of the most worshipped goddesses with over 1’500 temples in her name. She is the protector of the fishermen and sailors and by extension the protector of those who travel. People who have family abroad (studying or travelling) pray to the Goddess to protect their relatives while they are away and for safe & good return back home. Visitors are most welcome in the pagoda, the second we visited has opening times (if am right till 3:30pm). The gate is closed but you can just enter, the keeper will come to meet you and turn on the lights. I really enjoyed visiting the pagoda, so more with my in laws. They were telling me about when they were kids and used to play with all the cousins in the gardens while their grand-parents would pray. I told them they should take the kiddos and tell them about how the grew up. As I was leaving I was taking the picture from outside the pagodas, and it literally started to rain. I look up towards the mountain (because the sky was mostly blue over the pagodas, as you can see on the picture above in the post somewhere) and I saw the rain moving in on me and the cute little rainbow formed. It was a lovely day yes. The first temple I never knew about!! 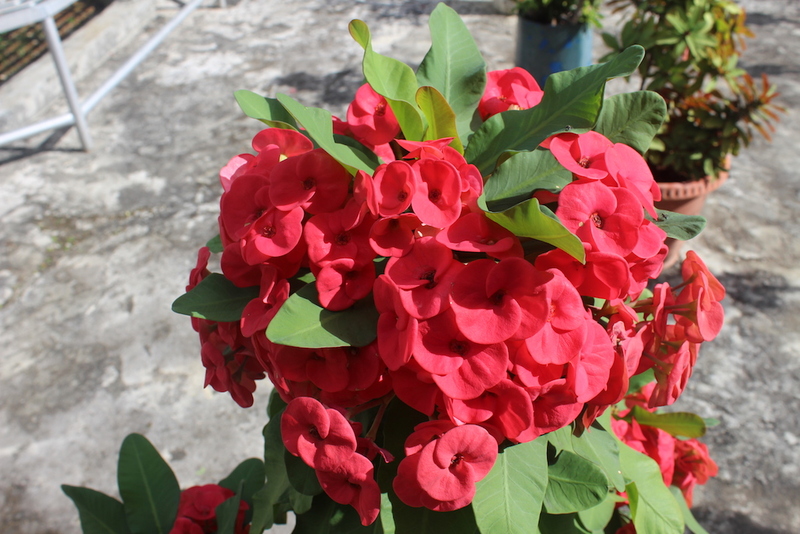 It is one of the reasons why i love Mauritius, the diversity is amazing! I generally find churches and mosques and temples to be full of “sattwa” – the Sanskrit word for light and truth – as opposed to feelings of activity or decay. These spaces uplift me, and yes, they are great for meditation or contemplation. One’s eyes are more open than usual, and things like rainbows appear. The briana looks incredible. One of my go-to meals around the globe. Especially in lands or towns with a Muslim influence, as the Muslim ladies make it phenomenally well.